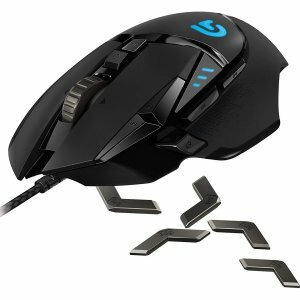 Amazon.com offers the Logitech G502 Proteus Spectrum RGB Tunable Gaming Mouse for $34.99. Features: Your favorite high-performance gaming mouse delivers more precise functionality than ever. Now, customize RGB lighting to match your style and environment or sync to other Logitech G products. Proteus SpectrumTM RGB Tunable Gaming Mouse features our most advanced optical sensor with exclusive Logitech-G Delta ZeroTM technology (PMW3366) for maximum tracking accuracy. No matter your gaming style, it’s easy to tweak Proteus SpectrumTM to match you: Set up custom profiles for your games, adjust sensitivity from 200 up to 12,000 DPI* and tune the five repositionable 3.6g weights for just the right balance and feel.